I remember being so excited when I heard Jack Black and Mos Def were doing a comedy together, being a big fan of both men. Misty from the phenomenal Cinema Schminema (killer blog name) takes a look at the results. Be Kind Rewind (2008) features Jack Black doing what Jack Black does best – running around all crazy like in a feel good flick. The unfortunate part is that the feel good part wears off relatively quickly and the movie goes the way of tedium. So Jerry (Black) hangs out with his friend Mike (Mos Def) in the video store where Mike works. Jerry’s kind of klutzy and kind of paranoid. After attempting to sabotage a nearby electrical substation, believing its energy to be melting his brain, Jerry becomes magnetized, and when he enters the store the next day, he inadvertently erases all the VHS tapes in the store. Uh-oh! Mike quickly discovers the disaster, and is further pressed when Miss Falewicz (Mia Farrow), Mr. Fletcher’s friend, wants to rent Ghostbusters. To prevent her from reporting a problem to Mr. Fletcher, Mike comes up with an idea: as Miss Falewicz has never seen the movie, he proposes to recreate the film using himself and Jerry as the actors and cheap special effects hoping to fool her. They complete the movie just in time when another customer asks for Rush Hour 2. Mike and Jerry repeat their filming, enlisting the help of Alma (Melonie Diaz), a local woman, for some of the parts. Soon word spreads of their epic remaking adventures and everyone in the neighborhood has a request. Hilarity ensues. Or something like that. 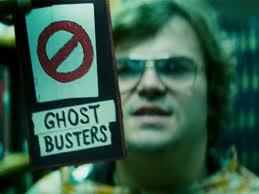 Not the best Jack Black flick ever made and certainly nothing noteworthy happening here. Mostly, after having watched I just want to gather up my friends and go remake some classic movies on the cheap. Simple fun for a rainy day? Misty is the creator and writer of the wonderful Cinema Schminema, a blog focusing on fantastic B Movies and the odd classic. Be sure to check it out and like her page on Facebook here. Thank you so much for letting me do this! I had a lot of fun! Reblogging now because I was nowhere near my computer all day yesterday. My pleasure Misty, thanks so much for writing the review. Not Now I’m Drinking a Beer and Watching a Movie is having Jack Black week and kindly asked me to do a guest review. 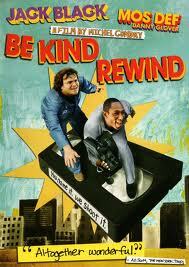 I chose Be Kind Rewind with Black and Mos Def so check out my thoughts and check out his site! It’s really cool AND there’s a contest going on right now! Ooohhh….contest!! 🙂 I’ll also be reviewing another classic movie this afternoon so stay tuned! Wow, I didn’t realize that I didn’t even know the plot of this movie. I never got around to watching it, and the premise still sounds awesome, but I can see it getting old. Sigourney has been the cameo master these last few years. Well, maybe I’m only thinking of The Cabin in the Woods, but still. I’m definitely with Misty on this one. Awesome premise, decidedly ordinary execution. Twas very disappointing. Sigourney was also the cameo in Paul wasn’t she? I had the same feeling as you, that she’s been popping up lots in those roles recently. Haven’t seen Paul. It looked like something I should catch on Netflix in a few years.